The joyful movement of today’s liturgy is best expressed by the antiphon for our responsorial psalm: The Lord has done great things for us; we are filled with joy. Last week’s theme was a little gloomy in comparison, as we looked at the end of the world and the fear that that will engender, yet leading to a glorious life with God for the faithful ones. Today we concentrate on the joy of God’s fulfilled promise. The prophet Baruch starts us off today with a really upbeat reading when he tells us to take off our black mourning garments and put on the glory of God! This beautiful prediction of God’s final victory over the forces of evil, the captives being brought back home and the roughness of the natural terrain softened to accommodate our human movement. Mountains are made low and valleys are filled up, deserts become shaded with trees and everything is to be bathed in the light of God’s glory. Baruch does not divide civilization into the sinners and the faithful as we did last week, but his hope is that all Jews will repent by acknowledging their sinfulness and their need for God, and all will be welcomed into this light of God. Just as a side note, despite the optimism and beauty of the Book of Baruch, it is not one of the books the Jews or the Protestants include in their Bibles, as Catholics always have. They are missing some optimistic and beautiful visions when they don’t include it. Now if this doesn’t sound a whole lot like the glum and sin-soaked repenting that we are used to hearing in Advent, it really is what Advent is about. We don’t forget the repentance part, though, but we concentrate on the results of that turning back, that acknowledgment of our sinfulness, and our repentance. And so, our Gospel today, still not beginning at the beginning, jumps to Luke’s Chapter 3 where we meet John the Baptist. Luke has told us that he wanted to set the record straight and we are told that he wants to write an historically accurate account – though what he means by historical accuracy is hardly what we mean by it today. And so, he begins Chapter 3 with the historical context. In one sentence, he places John the Baptist in the historical situation. It happened in the 15th year of the Roman Tiberius’ reign. We learn that Pontius Pilate was the governor of all Judea, that King Herod was the ruler in Galilee while his brother King Philip ruled Iturea and Trachonitis and King Lysanius was the ruler of Abilene, all neighboring kingdoms. So Luke is very exact in his dating of events as he is trying to teach Greeks who didn’t know much of Judean history the validity of his work. Then we meet John and we know immediately he is a prophet because Luke identifies him with the prophet Isaiah, giving him context in Hebrew history. Luke summarizes the message of John the Baptist very simply: he was “proclaiming a baptism of repentance for the forgiveness of sins.” That simply means that he was using the image of cleansing with water as an outward sign of what he wanted to happen interiorly to his followers. When they had admitted their sins and repented, they were washed clean in the waters as a visible sign of it. Without repentance, there could be no forgiveness of sin. So we then get a picture of John who comes out of the wilderness, a sign that he has fasted and prayed, and he is immediately compared by Luke to Isaiah’s prophecy. Luke doesn’t often use the Hebrew scriptures because he is writing to Gentiles, unlike Matthew or Mark, but he does here because it gives proof of John’s ability to prophesy. The quote from Isaiah is a common one for all of us by now, especially if you know Handel’s Messiah, but it concerns a person appearing from the wilderness and crying out that his mission is to get the people ready for someone great who is coming. I mentioned last week that another major theme of Luke was salvation for not just Jews but for all mankind, and the end of Isaiah’s quotation picks up on that theme when it says: all flesh shall see the salvation of God. The second reading today from Paul also picks up on this “joyfulness” theme, but now we are in the future, after Christ’s death. In these three readings, we move from prediction to actuality to after effect. Paul is constantly praying in joy for his Gentile brothers and sisters. He has been able to witness all flesh seeing the salvation of our God, and he is able to see the earthly result of it in the love that the brothers and sisters bear for each other. His prayer for his converts is that their love may overflow more and more and that the Spirit bring them knowledge and insight to help them live good lives so they will be ready for the second coming of Christ. I hope that today’s readings allow you reach forward in your minds and look toward the past event of Christ’s birth, his Incarnation, and look forward to this second coming when the kingdom will be fully here. We do this through love – how very cliché that sometimes sounds, but Christmas should mean love and finding ways to show that love – to our relatives and to strangers. We have four weeks to evaluate how we are doing in our love of God and neighbor, to look back over our lives, evaluate, and if there are things that need changing, to set out to do them. When we do, we can truly celebrate the first of many days of God’s love for us – the birth of our Savior, Jesus Christ. There was a famous movie and book by John Osborne – Look Back in Anger. The readings today suggest that that is wrong. We need to look Back in Love! And that is the Good News we all need to hear as each day grows darker literally and figuratively. Now we know what to do about it! Once again we begin a new church year, and we rapidly approach Christmas and all the celebration that entails. Advent is meant to remind us and renew our resolve and commitment. Paul reminds us in his letter to the Thessalonians today, the importance of love not only among ourselves but for all. Even in the earliest days of the church he was reminding his disciples that love wasn’t limited or meant to be constrained to only those we knew or had relationships with. As God’s love has no bounds, so our love should have no bounds. It should embrace everyone we meet, excluding no one as God himself embraces all. Yet, how is this so, in a world so fractured and divided and even violent? So much misunderstanding, hatred, and selfishness and so many other things permeate the world today, that living a Christian life seems so hard. Yet, as Christians, don’t we see that the biggest sign of our love was the Cross? God’s love came into the world, a man himself, Jesus the Son of God. He came into a fractured broken world to bring and show and embrace all with God’s love. That love was boundless and remains so even today. He loved and even forgave those who betrayed his love, even those who put him to death. Throughout his life, he loved, he counseled, he forgave, but never judged. Ultimately, we must remember there is one and only really one judge and that is myself. Each person and only that person knows their relationship with God and how that relationship effects the love and relationships they have. Surely, a person can live a life never deviating from the so called straight and narrow, following rules and laws etc, but as Paul says, what is it without love. Who we are is in our heart and mind and soul and only we ourselves and God can know intimately whats there, but ultimately we make the choice of who and what we are, and like it or not are the ultimate judge of our success or failure to love as we are called. But, let us not get discouraged, as love is not always perfect, at least not yet. All of us can and do at times fall short and need to work with others to ask forgiveness and progress. Love is something that grows and progresses day by day, year by year. Let us not forget Christ’s love and the Cross that forever exhibits that love. As we announced, today is the beginning of a new church year and each year we select one of the Gospels to concentrate on in out weekly readings. This year it is the Gospel of Luke. Because it is a cycle of three years, we occasionally switch to the Gospel of John during each of the years, but predominately the readings will be from Luke. Before we delve into today’s readings which come from the middle of Luke, not the beginning, I want to explain to you why there are four Gospels and why they are each a little different, and sometimes quite different. Suppose I took four of you from this congregation and gave you an assignment. I choose four people who were alive when John F. Kennedy was president and I ask you to write a 3000-word biography of Kennedy, doing very little research but just from the things you remember, things that you may have read about or things you had been told. Someone with a strong military background might want to show how Kennedy was a war hero and how that affected his decisions as President as in the Cuban missile crisis, for example. One woman might be enthralled by the idealism of the period – the Camelot years – and so does a portrait of Kennedy and his wife and family, showing Kennedy as a great family man who came from a great and noble lineage. A third person was disturbed by rumors of Kennedy’s assignations that were carefully hidden from the public and so his biography goes into the dalliances that Kennedy carried on. A fourth was intrigued by Kennedy in relation to the other presidents preceding and following him and so did more of a sociological study of how Kennedy’s administration changed what went before and predicted what went after. The four books that we end up with would all tell the same story – the facts would be much the same. He came from a politically important family, he was a war hero, he was the first Catholic president, he was a wonderful speaker who had a way with words, he helped the country prosper during his regime, he was a popular president, he was assassinated in Texas. All those facts would be in each book, but the purpose of each book, the reason it was written would be different. Because it was from memory, the events might not have the same chronological order, the stories that significantly affected the author’s point of view might be enlarged or might disappear. But each of the stories holds the main facts and uncovers essential truths. This might help to explain why we have four Gospels – actually there were many more – but four were chosen to be the most accurate for the needs of the early church. Luke’s version of the Gospel has all the main points of Matthew and Mark but includes a number of stories that do not appear in Matthew or Mark. That is because Luke had a different purpose. He was writing for a Gentile community and he was concerned with convincing that non-Jewish audience of the truth of Jesus. We will see numerous referencing to witnesses of the Gospel which give his story validity. Luke also wants to shift blame for Jesus’ death to the Jews because he is writing to Romans and doesn’t want to alienate them. In Luke, Pilate says three times that Jesus is innocent, for example compared to once in the other accounts. Luke says that his purpose is to give evidence through witnesses so that all who read him will know “the certainty of those things.” But he does this with the perspective of a non-Jew. Often the witnessing will occur in twos in Luke. For example, Jesus birth and John’s birth are put together. Both Mary and Elizabeth have revelations that they witness to. Both Simeon and Anna in the Temple give witness to the importance of Jesus. Watch for these. I will say more about the Gospel of Luke during the coming weeks, but we need to take a few moments now to talk about Advent, a time when we wait for the birth of Jesus in memory and align that with our waiting for Jesus to come again. That is why today we jump to the middle of Luke, basically continuing the ideas that have been brought to us in the last three weeks of the Gospel of Mark. At this point in the Gospel of Luke, Jesus is the prophet – predicting what will come at the end of time when the kingdom will finally be established. It is not a pretty picture – rather scary – actually – and people will be frightened by what is happening and what is to come. The first signs will be natural. Natural upheavals in weather will signal the second coming. Out of this the Son of Man, Jesus, will appear with great power and glory. But rather be frightened, Jesus tells us to raise our heads, to stand up and be aware that we will be redeemed. Jesus tells us not to get so involved in the things of the world and the way of the flesh but leave time to be on guard and watch for the signs. Get your house in order. Turn yourself around – the main theme of advent, the meaning of “repent” – and pray that God gives you strength during this time. Historically we have been frightened by these words but I think if we are truly living our lives as well as we can, are aware of our spirituality and religion, and are moral beings, loving our neighbors, that this should not scare us at all. St. Paul today stresses strengthening “our hearts in holiness that you may be blameless before our God and Father at the coming of our Lord Jesus with all his saints.” In the first reading, Jeremiah is predicting a Messiah who will be called righteous. Well, that righteous Messiah has already come and has “execute[d] justice and righteousness in the land.” Advent is a time to remember that first coming and to repent and turn ourselves around for the second coming. We celebrate that first coming as Christmas Day. We don’t know when the second will be. If it were tomorrow will you be ready? This is the Good News of repentance that we focus on in Advent. May we begin this week to be more alert and to turn our lives around in preparation for Christmas and the second Christmas to come! The feast of Christ the King is a relatively new feast on the calendar. Coming in 1925 at the behest of Pius XI. The 1920’s were a period of secularism, disrespect of authority and religion, and the rise or strengthening of dictatorships throughout the world. Human rights and the ability to worship and just the freedom of individuals was a concern. Even the independence of the Church and Pius XI was under siege from the time the Vatican had lost governance over the Papal States. It was a call by Pius to leaders and believers alike to realize that religion and faith were not necessarily an intimate part of politics and ruling of nations. Personal dignity and freedom given by God was something contained in every person and should be left to grow and bring each person to his final way of life. Is Christ a King? Certainly he is, but not in any real sense that that word conjures up in our imagination. Perhaps, through the centuries, men, even good men have tried to create a kingdom on earth, but such as we know is not meant to be. Christ was God made man who came to offer himself that we all would be embraced and brought on a path to to his Father in a kingdom about which we only know that God awaits in his eternal love. We are part of that kingdom now, but only if we live and are like Christ was. Christ was a servant, he loved, he gave of himself, in fact his very life he laid down so that all of us could have eternal life. Our theme today is best expressed in the Responsorial Psalm antiphon: “The Lord is King; he is robed in majesty”. This last Sunday of the church year we look at the now and at the future when the kingdom of heaven, here now but veiled, will be seen in all its glory as the King of the kingdom of heaven comes to claim his throne – a throne that will be everlasting and that shall never be destroyed. It is the same kingdom of heaven that the Gospels tells us about over and over. We start with Daniel’s dream six hundred years before Christ. He uses the term “son of man.” The term “the Son of Man” is a Biblical term that we hear a lot in the Gospels and in a sense it just means “a human being”, someone born of a human. The term is used a great many times in the Gospels, and it has been suggested that it is just a poetic way of saying “myself”. If you google the term it will tell you that interpretation of this term, son of man, has been divided and there is no one agreed-upon answer to what it means. It first appears in the Book of Daniel, but it is specified there for the person coming with the clouds of heaven is one “like” a son of man. Looking backwards into the Bible, for Christians, this is an obvious reference to Christ who is both human and divine. 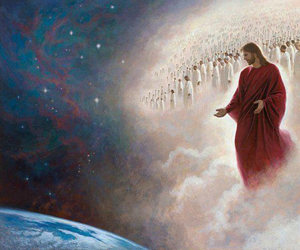 He is the son of man, meaning a human being, but he is also Son of God, which allows him to come with the clouds of heaven and be given dominion, glory and kingship. To me, this is an early reference to Christ as an incarnated God. Whether we completely understand the term or not, however, it is clear that Daniel’s vision today is one where this heavenly human was made by God king of all peoples, and that he should be served by all nations, all peoples, in all languages. This was the vision of Daniel hundreds of years before the coming of Christ. It was a vision that came true. When we get to the New Testament we hear the terms ‘son of man’ and ‘son of God’ quite often. The kingship of Jesus was something that the Gospel writers and Paul talked about and tried to prove often in their writings. 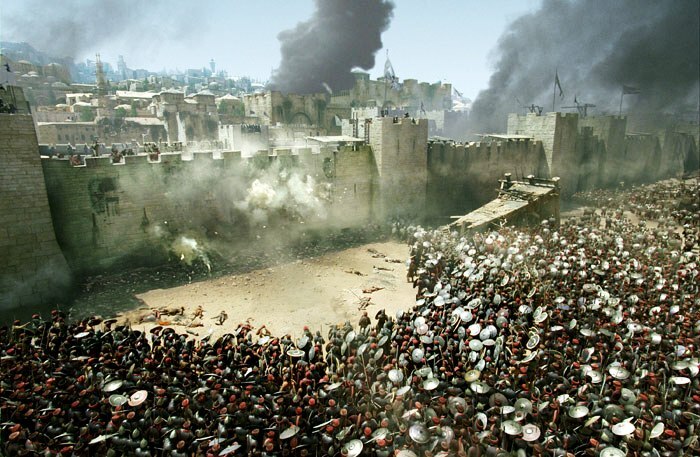 It also had messianic overtones because the Hebrews believed through the prophets that there would be a great king to rise up from the line of King David who would save them by conquering all other lands. He would be the king of kings. While all of this came true, it didn’t happen in the way that they thought. There was no armed King who would conquer lands and lead them through war and revolution to this new kingdom. Instead, they got a different kind of king, but a king no less. The last book of the Bible, Revelations, is particularly appropriate for reading today because it is all about endings – the ending of earthly kingdoms, the end of time as we know it, the end of Jesus being apart from us for he comes again. The Book of Revelation echoes much of the vision of Daniel, and so we see Christ coming in the clouds. He began all things with his Word and he will now end all things as we know it. He is Alpha and Omega, A and Z, beginning and end. Just as in Daniel our response to Jesus is to give him glory and dominion forever. We know that he has redeemed us and that he loves us beyond any sense of love that we may ourselves know and understand. So, the first two readings today are prophetic, dream-like and visionary, full of high theology and difficult metaphor and symbolism. But when we get to the Gospel we turn to simplicity itself. Jesus is on trial, presumably for blasphemy because he equated himself with God, and for claiming that he was a king in his own right. Pilate is very direct and asks him specifically about it. “Are you the king of the Jews?”. In other accounts, Jesus is silent, but in John, he answers Pilate at first in the negative because he is more than a king of just the Jews. He answers with the truth: “My kingdom is not from this world.” The kings of the world are temporal, area-bound kings. Jesus is spiritual king receiving his power from God and from his obedience to the Father, and thus his kingdom is over all people and all things. Then Jesus says that the whole reason he was born and came into the world was to testify to the truth, to which Pilate infamously and possibly sarcastically replies, “What is truth”. For John, the truth is God. He is the essence of truth, and going back to the opening of John’s Gospel we remember that God sent his Word, which would then have to be truth itself. So we, as humans, can only know the truth by listening to Jesus. The kingship presented by John then is knowing that we are loved, held, cared for, saved, and chosen by a Triune God that we willingly want to serve and thank for the blessings he has bestowed. That we have been freed from our sins by his blood! as Revelations announces today, and which we celebrate as a community each week in remembrance of him. As we end our church year we need to put kingship, so foreign to Americans, into the perspective of our needing to be grateful and to serve a Creator who is Truth and Love and all Good Things. Having our Thanksgiving so close to this feast is a wonderful reminder also of what we need to be thankful for – physical things, of course – harvest, sunsets, health, family – but also, of what he has done for us in the spiritual realm by humbling himself by becoming human, loving us enough to die for us, destroying the effects of death so that we can live eternally, and all without our having done anything to merit it or deserve it. So much to be thankful for! So let us give thanks to this spiritual King who will someday be a physical resurrected King of the earth as it meets heaven and close our church year with awesome images of the end of the world instead of all the ‘fearful’ terrifying ones we get in the media. Christ is our King, Christ is our Truth, and we know God, by knowing Him. Just a few things to ponder and really Good News to close out our church year! Today’s readings are similar to the readings at the end of every church year. Apocalyptic and Cataclysmic renderings of events and descriptions used to render a certain fear and consternation of the coming of end times and Jesus’ second coming. As believing Christians, we have faith, certainly, and a sense of uneasiness that at times we fall short of the perfect love we should have, but if we remain positive and work toward that love of Christ, why should we have fear? Christ is with us now. We actively share his body and blood in the Eucharist. He has sent his Spirit among us to guide and help us along the way. At the end of our path, he awaits, loving and welcoming us to be with him and his Father. All of us ultimately meet him, and the end of life, be it individually or collectively is the achievement of life and a new beginning of a whole life which we can not now know but we know it has been prepared for us by our faith. God’s love is an embrace surrounding all of humanity from the beginning to the end. Christ’s call to all and his love and concern that all have the chance and opportunity to know and love and share God’s beneficence, should make us more comfortable as we approach our final union with him. Love is certainly a much greater motivator than fear, although fear is sometimes a better short term solution. But seriously consider, what relationship lasts or is fruitful if it is based on fear alone. In our society, does fear of punishment stop people from doing wrong and evil things? Love at least make people stop and think and consider how and why things are good or evil. That is not to say that people can not make mistakes or wrong decisions, but ultimately only God knows each and every person for who they are and what they do, and he alone can only judge their love or lack thereof. Mark wrote his gospel about the year 60. We can see in his and other wrings of the time, that the early community expected Jesus’ return to be imminent. The fall of Jerusalem was a real sense of an apocalyptic end to them. Yet Jesus has yet to come. Every century, every age almost has issued warnings and almost pleas for the end. 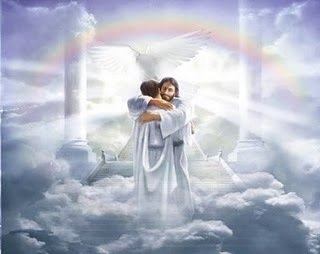 Yet, Jesus said only his Father knows that time, and truly all of humanity will one day be together in God’s embrace and will only then know fully the love of God. I would like to begin today with he short passage from the last chapter of the book of the prophet Daniel. We don’t often get to read Daniel in our liturgies the way they have been laid out, but this week and next we hear two passages from this apocalyptic prophet. The Book of Daniel is a rather strange book in the Old Testament. The first half of it is three really good stories and is an easy read, but the second half is mystic, dream-like, confusing and often about things that have not yet happened that Daniel saw in his visions. Today’s selection is from the last chapter and is a piece often read at funerals. It shows a distinct change in the theological thinking of the Hebrews because, up to this point, the Jews didn’t have much to say about an after-life. They had a place that we hear about in the Psalm today, Sheol, a place where the dead were gathered with their families. There here-and-now was the important thing, what the Psalmist calls “the path of life”. This after-death place was a vague holding place many Jews believed in, but with Daniel we encounter something new. In this reading Michael, the prince of angels, presumably, will rise up at the end of time during some sort of world-wide catastrophe. At this point, there will be a resurrection of the dead. However, it doesn’t say everybody, but many will rise. There will apparently be some sort of judgment because some of those risen will have everlasting life and others will have everlasting shame. The main thrust of the reading though goes to those who have maintained wisdom and those who have influenced others to be righteous. They will be the real stars! In fact that is exactly the metaphor Daniel uses – shining like the brightness of the sky… like stars forever and ever. As we near the end of the church year next Sunday, the thought of the liturgy usually turns to the end of time and what the Bible has to say about it. And so, we begin with Daniel’s vision of the last days and then move to Jesus’ own description of that time as Mark writes it. Jesus describes it in a similar way to Daniel – that there will be some sort of cataclysmic event causing a time of suffering for all people. When that happens and everything seems hopeless, The Son of Man will come from heaven manifesting great power and glory. Jesus will send his angels to collect “the elect”, those who have been judged to have followed Jesus and his two great commandments. Jesus also indicates that there will be signs that this is going to happen and he uses a fig tree as an example. You know when a fig tree is going to bloom by looking for the signs of its blossoming, and when that happens you know that summer will soon arrive. Similarly, we will be able, if we watch for it, to determine by signs that this event will be coming soon. At this point, we hear Jesus say something that just seems like he didn’t know what he was talking about. He got it wrong. He says, “this generation will not pass away until all these things have taken place.” I can say two things about this. Just after that he says that he may be just guessing because only the Father really knows when this will happen – and he specifically says that the Son doesn’t know either. Or… perhaps the sign of the coming judgment is Jesus’ own death and resurrection which indeed happened during that generation’s lifetime. Without Jesus death to open the kingdom of heaven, there could be no final judgment because heaven would still be closed to us. And so, when Paul says today in Hebrews: “For by a single offering [Jesus] has perfected for all time those who are sanctified.” It is only through the sacrifice of Christ that we have been redeemed and that there is a possibility of our resurrection and being part of the elect who will be brought into a new world order: the complete and fulfilled kingdom of heaven. In trying to determine what this can mean to us this week, we might turn to the Gospel acclamation today which states: “Be alert at all times, praying that you may be able to stand before the Son of Man.” As Christians, we need to always keep our end in view. We talk about our lives as journeys, and that is so true. But journeys have destinations. Jesus has given us a way, a path of life. In fact, the early Church uses to call themselves, not Christians, but the Way. By keeping that destination in mind, and having some vague knowledge about our end and the end of time, we need to weigh the individual daily decisions we make with the end we want in view. We need to pray for that wisdom that Daniel says we need in order to shine brightly. We need to pray that we continue to follow the path and to show others the path as well. I know that some of us do ask the question “What would Jesus have done?” when we make decisions, but it might be better to ask: am I following the law of love for God and neighbor in this decision? Am I staying on the path Jesus taught? Food for thought this week as we hear the Good News that we have been saved and that our destination is there, waiting for us to take the right path to get to it!